Q: How do InterDry absorbers help to solve moisture problems? InterDry absorbers contain Calcium chloride that very aggressively grab and absorb moisture from the air. They dry the air. When there air is dry, there are no moisture problems. Q: Can InterDry absorbers solve all moisture problems? Well, not all. Some cargoes may be so wet that any reasonable number of InterDry absorbers get overwhelmed. But InterDry absorbers can reliable protect even very difficult cargoes that may contain tons of moisture, such as coffee beans, wood products or paper. 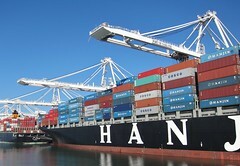 Q: I load my container under dry conditions and it is very tightly sealed. How come I still experience moisture problems? Your cargo or the packaging, including container floors, pallets and crates, contain moisture that is evaporated into the air during transport. Wet packaging material is the most common cause of unexpected moisture problems. Q: I have shipped the same cargo for years with InterDry absorbers without any trouble, but now I have a lot of damage. Have you changed the poles? Check your container and your packaging material. Did you just start to store your pallets outdoors? Does your forklift drive into the container with snow on the wheels? Did you just change supplier of crates? You can’t tell by looking whether wood are carton is dry. The moisture properties of wood and cartons have an exponential character. It makes a huge difference if your pallets moisture content should be 20% instead of 17%, say. Q: I ship consumer goods in tubes/cans/jars etc that contain no moisture, yet I still have problems. Consumer goods are often shipped with a lot of cardboard packaging. Even if the boxes seem dry they could literally hold tons of water. Q: Each container of my cargo of peanuts/coffee/cocoa contains tons of moisture. What difference does it make that InterDry absorbers absorb a few litres during a voyage? All the important things that happen have an exponential character. That means that a small change in circumstances can have a huge effect on the outcome. InterDry absorbers create circumstances that allow almost all of the moisture to remain in the cargo even while the level of humidity in the air is lowered by a crucial amount, sufficient to prevent damage. It is a question of ”leverage”. Q: Does it make a lot of difference that my cocoa beans have a moisture content of 8% instead of 7%? Yes, such a difference could be all the difference between no damage and disaster. The moisture behaviour of most agricultural products have a strong exponential character. Q: My cargo of peanuts had suffered damage in the centre even though the outside of the cargo looked fine and there was were no signs of condensation? 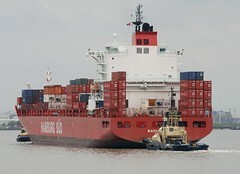 Lots, if not most, damage to cargoes is caused by prolonged periods of elevated humidity without any condensation (Container rain, Container sweat, Super Saturation Event). It is common that cargoes loaded at cool temperature and then moved into warm condition suffer damage in the centre of the cargo as a result of a difference in temperature between the outside and the centre of the cargo. Warm air from the outside of the cargo becomes humid as it moves into the cooler centre. InterDry absorbers protect against this effect even though the absorbers are mounted on the container walls. Q: I had damage to my cargo even though I used lots of silica gel and there was no condensation. Would it help to switch to InterDry absorbers? Calcium chloride absorbs moisture even when the humidity is not very high. This protects the cargo against damage caused by prolonged periods of elevated humidity. Some kinds of steel start to corrode at 70% relative humidity, moulds can grow at 80% relative humidity and at near 90% relative humidity lots of things go wrong. Yet, InterDry absorbers are also at their most efficient protecting against condensation. Most other products, such as silica gels, are really effective only in very humid conditions and in protecting the cargo against condensation damage. Q: What is so great about InterDry absorbers anyway? Well, they will not fall off the wall, get punctured during loading and unloading, leave a wet puddle on the cargo or run out after half the voyage. They are installed in seconds without ladders and take up no cargo space. The capacity of each absorber is big, so fewer is required. The cost of an installation is very competitive, even against much inferior alternatives. Q: How many absorbers do I need? The number of InterDry absorbers required to protect the cargo depends on the cargo, the temperature conditions during the voyage, the length of the voyage – and just how safe you want to be. For some really dry cargoes e.g.. steel coils or household removals, 2-3 InterDry absorbers are enough. For a lot of ”normal” goods 4-6 InterDry absorbers is about right. Some cargoes with very difficult moisture properties on long voyages may require up to 16 InterDry absorbers. Q: Do I need to line my container with kraft paper? Lots of containers are lined with Kraft paper primarily for reasons of hygiene or to simply isolate the cargo from direct contact with the container walls. The liner will act as a kind of sponge, catching and absorbing any droplets of water and then re-evaporating the moisture into the air. If liner is used without InterDry absorbers it could contribute top a kind of pumping effect, drawing moisture out of the cargo. When used together with InterDry absorbers the liner will act as a buffer in extreme conditions, and will prevent any container rain from reaching the cargo. Much the same can be said for so called dew cloths. Q: My container is absolutely filled with cargo. Will the InterDry absorbers still work? Moisture diffuses very effectively, even through a seemingly compact cargo. Experience shows that InterDry absorbers will make a difference even to mould growth inside cartons in the cargo. It is, however, necessary that some free space is left in front of each InterDry absorbers. If some InterDry absorbers have collected less water than others inside a container, there may be a problem with air access to those absorbers. Q: I have problems with mould growth inside my shrink-wrapped pallets. Will InterDry absorbers help? Yes, so long that there is some access of air through the top and bottom of the pallets. If this is not possible, a spiked roller may be used to tear holes in the shrink wrap. Q: My shipments of steel/galvanised components/aluminium/ machinery etc arrives corroded, stained or discoloured despite heavy packaging. Will InterDry absorbers help? You can forget about your tectyl, coatings, oil-paper and plastic wraps that are expensive both to apply and remove. Your container can probably be equipped with a sufficient number of InterDry absorbers to protect against any damage at less cost than your present packaging. Q: I got some brine on my hands while removing used InterDry absorbers . Is it dangerous? No it isn’t. Calcium chloride is non-toxic and environmentally safe. It is the second biggest constituent of sea-salt and is liberally sprinkled over icy roads in cold countries. The brine is somewhat similar to very salty seawater, and may cause irritation and rashes if left to dry on the skin. We recommend that you wear gloves and goggles when handling used absorbers, but should you get splashed by brine just wash off immediately with lots of fresh water. Q: Can I re-cycle my used absorbers? The absorbers can not be re-used but can be disposed of environmentally friendly. It doesn’t contain any harmful chemicals. We like to present the Nordic Power Desiccant moisture protection program as a kind of checklist of things that should be arranged as well as possible. And it is to be noted that many of the items on the list can be influenced only to a degree. Yet even small changes can result in big improvements. In some cases a few tens of grams of water in the wrong place is enough to cause significant damage. There are different types of absorbers with different properties. Calcium Chloride based absorbers are by far best suited for use in the container. For several reasons, perhaps most importantly because they do not risk re-evaporation of already absorbed moisture, the Nordic absorbers are by far the best and safest of the Calcium Chloride absorbers. How many Nordic Magnums or Picollos are required depends on the cargo, how long the voyage is and what risk of damage is acceptable. For a dry cargo 4 Picollos 1000 are often sufficient in a 20 ft container. How much water has collected in the Nordic Absorbers? Is the amount about the same in all the absorbers or does it differ according to placement? 3. When closing the container, the humidity is contained in a very small space. As the container is moved from one climate to another, the humidity vaporizes up into the ceiling of the container, where it will start to rain down onto the cargo. Either the humidity will start to soak into the cargo or run along the surface of i e steel products. It can also turn into water that runs towards the bottom of the container. Nordic Container Desiccant actually “catches” the moisture before it vaporizes. 7. The best insurance there is – using Nordic Power Desiccants. The effect is 40 – 60 % better than other products in the market.